For the 2019 recreation season Cumberland Point will be open May 16 - September 22, 2019. Contact the Recreation.gov reservation line toll-free at 1-877-444-6777 between 10 a.m. to midnight Eastern Standard Time between March 1 and Oct. 31 and 10 a.m. and 10 p.m. EST between Nov. 1 and end of February for information and to make a reservation. Call centers are closed on Thanksgiving, Christmas, and New Years Day. Group sales for ticketing is closed on Sundays. You can also get information and make reservations online here at Recreation.gov. Cumberland Point Recreation Area has thirty (30) campsites with water and electric hook-ups. The campground has many scenic vistas and is noted for its breathtaking sunsets. Many visitors that come to Cumberland Point campground take advantage of fishing and boating. There is a large playground with an adjoining horseshoe pit for your recreational enjoyment. The day use area offers a large open picnic shelter that can accommodate family reunions and group picnics. This recreation area is located at the mid-point of Lake Cumberland on the main lake at the mouth of Faubush Creek. It is approximately ten (10) miles west of Nancy, KY off of Highway 761 and is near Conley Bottom Resort by way of water. 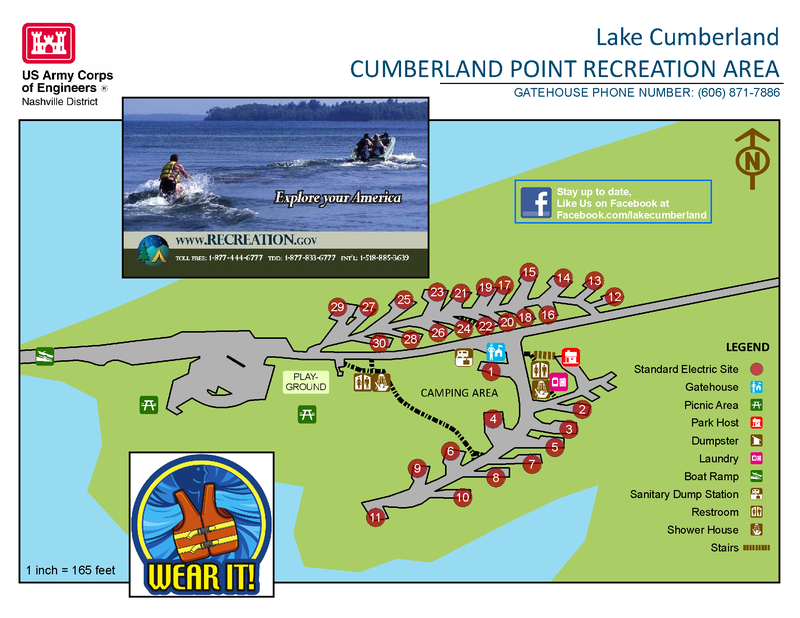 For a map of Cumberland Point Recreation Area and campground regulations please click the image below.